How to make Kimchi at home! Y’all, as I write this the sky has finally decided to try out a shade of blue for a change and the sun is shining like it just found it’s calling! It’s 76 degrees and beautiful in Alabama so I am typing from my back porch – as is only fitting. I hope it’s pretty where you are at as well. Kimchi is a traditional Korean side dish of fermented vegetables. It is similar to sauerkraut in preparation but with different ingredients – and usually spicy. Not only is it delicious but it is also very good for you! The printable recipe is at the bottom of this post. Feel free to scroll ahead if you’d rather not chat or don’t want to read the tips and tricks for making successful kimchi. Anyone who has been reading my ramblings for a while probably knows that I became a huge fan of Korean Dramas about four years ago (see here and here) and essentially gave up English speaking television for the wonderful world of South Korean programming. If that sounds strange to you, hang on because now that you’ve started thinking about it you’ll probably begin to notice more and more people around you talking about it. We are an ever growing group of folks and it’s so exciting to find others with the same interest. As of now, I’d venture to say that about 1 in 3 of my friends are what we refer to as “Kdrama addicts”. We aren’t really addicted, mind you, but that one to two hours a week is something we really look forward to – and perhaps a marathon on the weekends from time to time for a special treat. Well, the thing is that you just cannot watch Korean television without wanting to eat Korean food. As I’ve mentioned in other posts, they just make it look SO GOOD when they eat – and just about every episode features the characters eating at some point – with zeal. Sooner or later, you’re going to find yourself wanting to try Kimchi. Dramas show families sitting happily on their living room floors making it, grocery stores sell it in glass jars, and Korean restaurants serve it. But making your own is about as easy as it gets and you have plenty of room for customization, so you know I had to show you how. 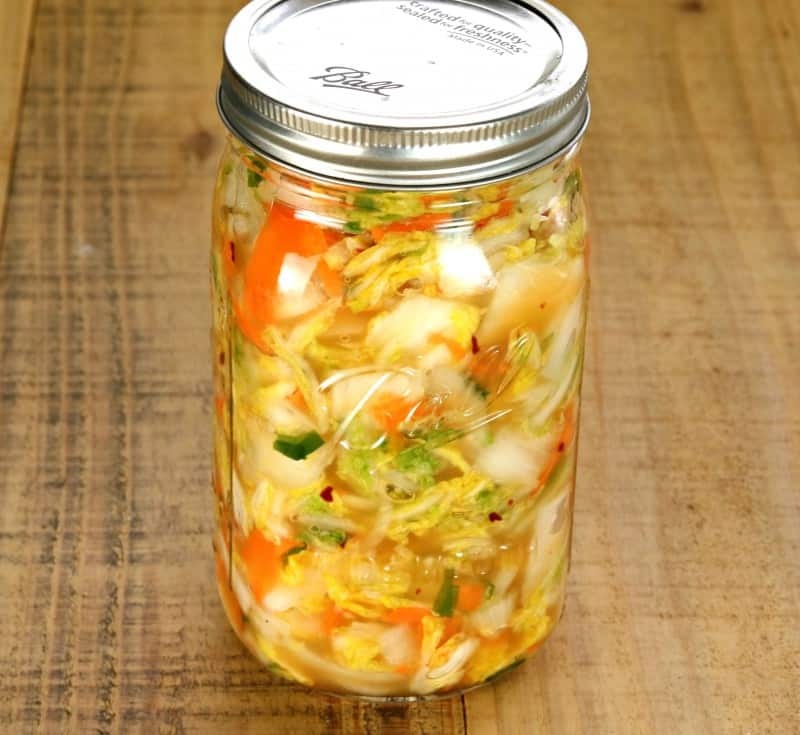 Now, you can use a fermenting pot (info at bottom of post), which I do nowadays if I am making a big batch, but it is absolutely possible to make great Kimchi using just a mason jar, which is how I am showing you today. A note: Is this authentic Kimchi? Y’all, I am a ninth generation Alabamian who has never stepped foot inside South Korea. Of course this isn’t authentic Kimchi. However, it is authentic Christy- Jordan-who-has-lived-in-Alabama-all-her-life-and-really-likes-Kimchi-so-she-decided-to-make-it-and-show-you-her-recipe, Kimchi. As far as that goes, it’s the real deal. Today I’m showing you how to make a small batch, about a quart jar’s worth. There might be enough to make a quart and a pint jar so just have an extra jar handy in case. As I mentioned, Kimchi is something that is really easy to customize to your own taste but I’m giving you how I do it as a starting point. Y’all can then take the ball and run with it. You’ll need: Green onions, carrots, a regular onion, nappa cabbage, minced garlic, minced ginger, some kind of salt that is not iodized, and some crushed red pepper*. Traditional Kimchi has a red pepper powder and daikon radishes. Crushed red pepper flakes work just fine and I’ve only seen a daikon radish on the internet so I quickly decided that wasn’t a hill worth dying on for me. I’m sure you could find the exact ingredients if you went around to some different stores, looked online, or went to an Asian market, but I prefer to just use what I can easily acquire. *Go easy on the red pepper unless you just really love spicy stuff because it is going to get progressively stronger as the Kimchi ripens and the spiciness will completely permeate the kimchi. This is as simple as the sauerkraut I showed you a couple of weeks ago. Just finely dice, chop, or shred all of your veggies (your preference) and place them in a large bowl. Add all other ingredients. Then, using gloved or really clean hands, commence to squeezing and mixing it in the bowl for several minutes. Not only does this mix it up well but it also helps draw the juices out. You want to have enough juice to cover your Kimchi once you jar it, although it may take a day or two for that much juice to develop. Our point here is to give it a head start. You want to really bruise your veggies, squeeze, mix, squeeze, mix. After a few minutes it will look like this, significantly decreased in volume. At this point, we want to pack it into a quart jar. When I say “pack” I’m not kidding. Really press it down in there. Once it is in, press it down some more. Then, put the lid on it. If you have some that won’t fit, put it in another jar. Let this sit out on your counter for about a week and twice a day open and shut the lid to release pressure as the kimchi ferments. What if there isn’t enough liquid? There should be enough liquid to cover the kimchi by the next day. On the off chance that there isn’t, heat 2 cups of water to boiling, stir in 3/4 of a tablespoon of salt (remember, not iodized salt), and then allow to cool completely. 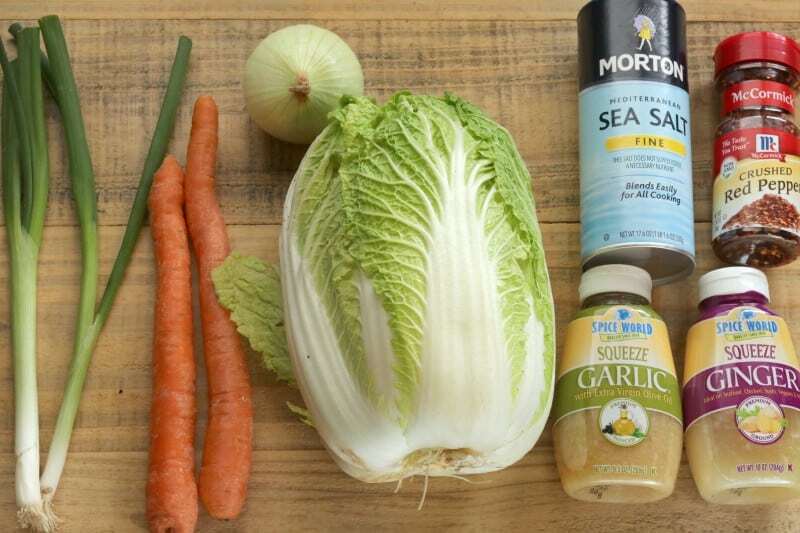 You now have a brine and you can add as much of this as is needed to cover your kimchi (or whatever else you are fermenting, such as sauerkraut). Just make sure you open and shut the lid twice a day for the week or so that it is out in order to release gases that build up. If you forget for a day or two, it’s best to put the jar down in a plastic grocery sack and then open it, as there will likely be some spewing from pressure build up, but your Kimchi is just fine. Close the jar once the pressure is released, give it a quick rinse, and carry on. When is it ready? I find that Kimchi is ready much sooner than sauerkraut is. Mine is generally good to go in about a week. At that point I put it in jars and store it in my refrigerator, where it gets even better in another week or two (but I start eating it right away). You can tell if your Kimchi is ripe by the taste and smell. You won’t be able to taste individual ingredients anymore, but rather it will all have a new, combined, full bodied taste in every bite. If you’re using a fermenting pot, you’ll notice that the “burps” (little gas bubbles coming out through the water seal) become far more frequent and family members will complain about the smell 🙂 Kimchi is wonderful, but does not make the best air freshener. Do I need special equipment to make this in a jar? What about fancy venting lids or pickling pipes or weights or a tiny little monkey who dances on top of the jar until it is done fermenting and then stops and sings the national anthem? You can certainly buy all sorts of accessories in order to make fermenting in glass jars more convenient, fermenting pipes, glass weights, special lids, etc, but a simple glass jar with a human to open and shut it twice a day to release pressure is all that is needed. If you are considering purchasing some of the aforementioned accessories, I would suggest you first look at putting that money towards a fermenting pot, which can really be a hands off process of true convenience. I’m about to show you how I make it in my fermenting pot and then link to two really great ones. 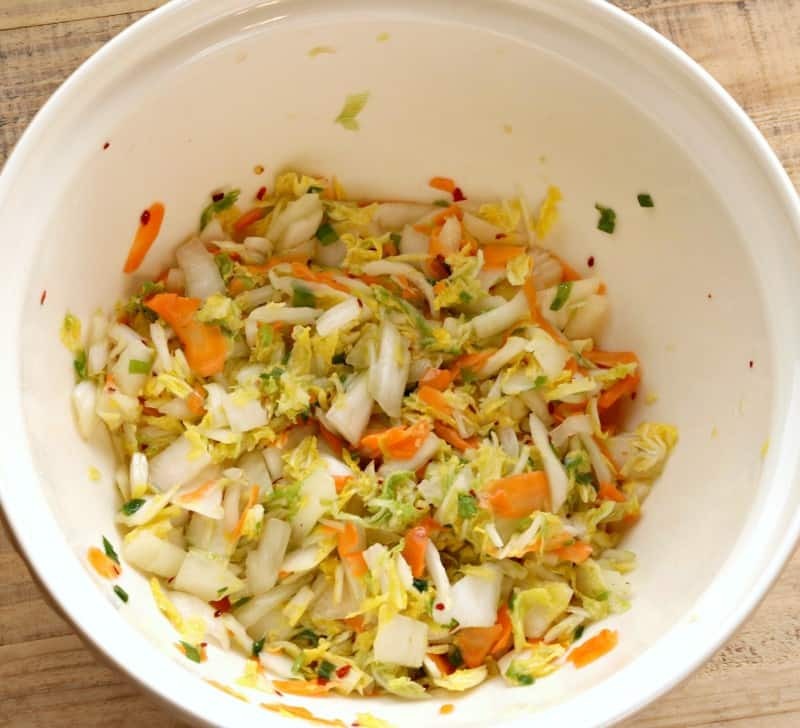 Here are the steps I take to make a fermenting jar full of Kimchi. Then, I pack it all in my fermenting pot and add the weights. Place the lid on top. The tops of these fermenting jars have a little moat around them that you fill with water. This prevents mold from getting in your kimchi and also allows gases to escape as the kimchi ferments. I just check the water in the moat every few days and open it up when it’s ready to be jarred! Interested in a Fermenting Pot like I have? Here are two really good ones: Humble House Sauerkrock and Harvest Fiesta Fermentation Crock. In about a week, ENJOY YOUR DELICIOUS KIMCHI! Peel onion and carrot. Dice or spread all veggies (your preference) and place them in a large bowl. Using very clean or gloved hands, squeeze and mix ingredients repeatedly until they have reduced in volume by about half and are leeching liquid. Pack ingredients into a quart size jar - or two jars if need be. Place in cool somewhat dark place (kitchen counter is fine) and open and shut the lid twice a day to vent until kimchi is ready, about one week. See post for tips and hints on making this and knowing when it is ripe. Once Kimchi is ripened, store in the refrigerator. Note: My starting point for this recipe was found in Nourishing Traditions, a great cookbook with all sorts of wonderful information about eating the way our ancestors did. It’s a fascinating read and always a great resource. If you’d like to learn more about it or order a copy, click here. Low Carb Zucchini Fries – YUM! As if I didn’t love you know already and own all your cookbooks! Kimchi! My husband has been to korea and we have Korean friends so we’ve always had kimchi in our fridge the eight years we’ve been married, even our early poor days. The last time we needed some, our Korean friend picked it up for us so we have a half gallon pot taking up half our fridge now. I never once considered making it myself before now. Yay! Glad to have a small batch recipe to keep at home. Unlike the dramas, I’d probably be the only one in my house eating it so I don’t want to make a ton. I like a nice bright flavored kimchi. Oh wow! I will definitely check it out, thank you! I just finished Hwarang and Scarlet Heart, have you seen those? Please tell me you watched Descendants of the Sun! How do you watch these dramas I have direct tv? DramaFever and Viki are the most the 2 main sites for dramas. Thank you so much for this recipe. I can’t wait to try it! I think for the price, I will use ball jars to make it in! There is an Asian grocery store in Sacramento, CA that had Kimchi…my husband wanted to try some (he loves spicy stuff). I use to buy a brand that was made in Hawaii. On a trip to Korea in 1997, he had the opportunity to try homemade Kimchi. I don’t eat spicy food and can’t get pass the smell. 🙂 Everywhere we went in Korea there was the constant smell of garlic and fermenting cabbage. They bury huge crocks in the ground when they are making it. I know you said it’s not authentic…But this is definitely NOT kimchi. Please stick to southern cooking! The napa cabbage should be salted and thoroughly rinsed to draw all of the water out. This helps in the fermentation and preservation process. 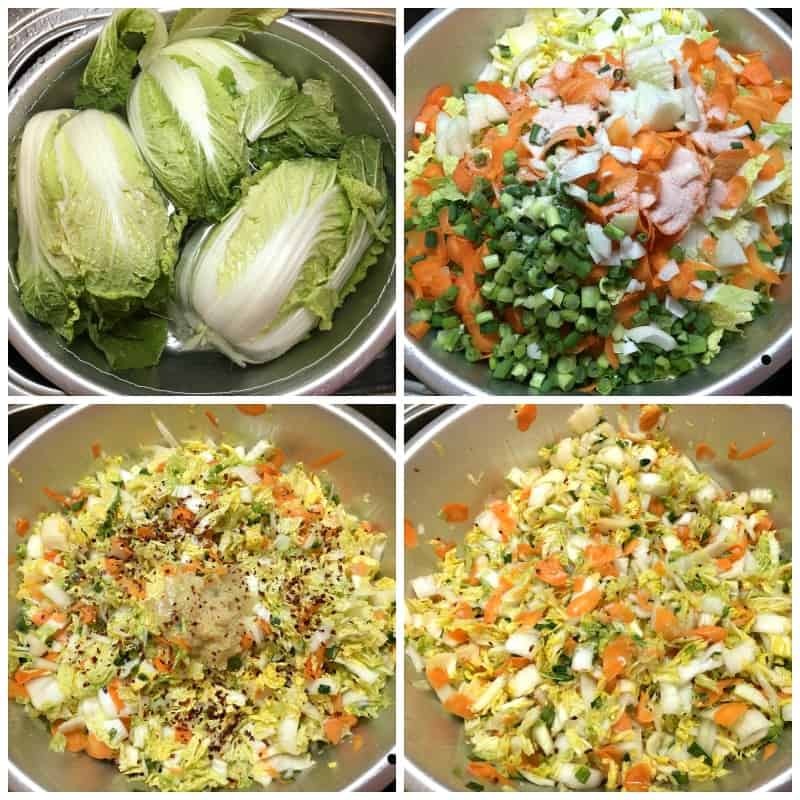 When all of the water is drawn out of the cabbage, the flavors can penetrate the cabbage easier. You should not be telling people that kimchi is traditionally made with chili powder (as you did on your Facebook page multiple times). Chili powder is NOT used in kimchi! Koreans use gochugaru, or Korean hot pepper flakes/powder. It is EASY to find, especially in Huntsville. If all else fails, you can buy it on Amazon. McCormick red pepper flakes have a different flavor than Korean red pepper powder and should not be used. And kimchi is not “spicy” at all. If properly made, it has more of a sour flavor than anything else. If anyone wants to know how to make real kimchi, please learn from a Korean. Maangchi and Seongkyound Longest have amazing recipes that are easy to follow. And if you don’t want a lot of kimchi, cut the recipe in half! Please stick to what you know: southern cooking. Your recipes are great, but this one is full of misinformation. This looks awesome, Christy! Kimchi has been on my list to try making for ages. My husband loves it and my whole crew adores Korean food. Thanks! i hope you get the chance to try it soon!!! 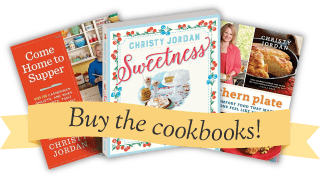 I thoroughly enjoy your blog; your recipes and the inspiration you share with your readers. I am anxious to try this recipe. I tried Kimchi for the first time last week at an Asian buffet, and I loved it. Kind of like spicy, healthy pickles. My husband loves hard boiled eggs, and frequently perfumes our kitchen with their scent. . He may have met his match with my fermenting cabbage! I hope you get the chance to try it soon!! I can’t wait to hear what you think. Thanks so much for your awesome recipes. Where did you purchase the bottled ginger shown in the picture? I got that at Wal Mart in the produce dept next to the jars of minced garlic. This kimchi looks FANTASTIC. I’m a total Korean skin care junkie, but I’ve never tried a KDrama. Crazy, right? Maybe I’ll grab a bowl of kimchi and try some! Thanks for including my Korean BBQ Steak Rice Bowls! Yay! Looking forward to trying this 🙂 I love kimchi. I always have it on the side of beef stews and curry stew. I just love the fresh twang and spicy flavor. I never would have thought to make it myself. Thanks for the inspiration. That is so neat that my favorite food blogger is a K-drama fan! My daughter is a HUGE K-drama fan and has been for about four years now. She lived in NYC after college and loved going to Korea-town for Korean food. Her dream was to live in South Korea and after a year of preparation she finally arrived in Korea just last night to begin her new career teaching English to Kindergartners! This mama is so proud and sad all at once! Thanks for comforting my heart with his recipe! It will definitely be making it! Oh my goodness!!! What an adventure – but I can only imagine the mixture of excitement and anxiety. I would love to hear how she is doing so please comment again with updates when you can! I can’t wait to try this . 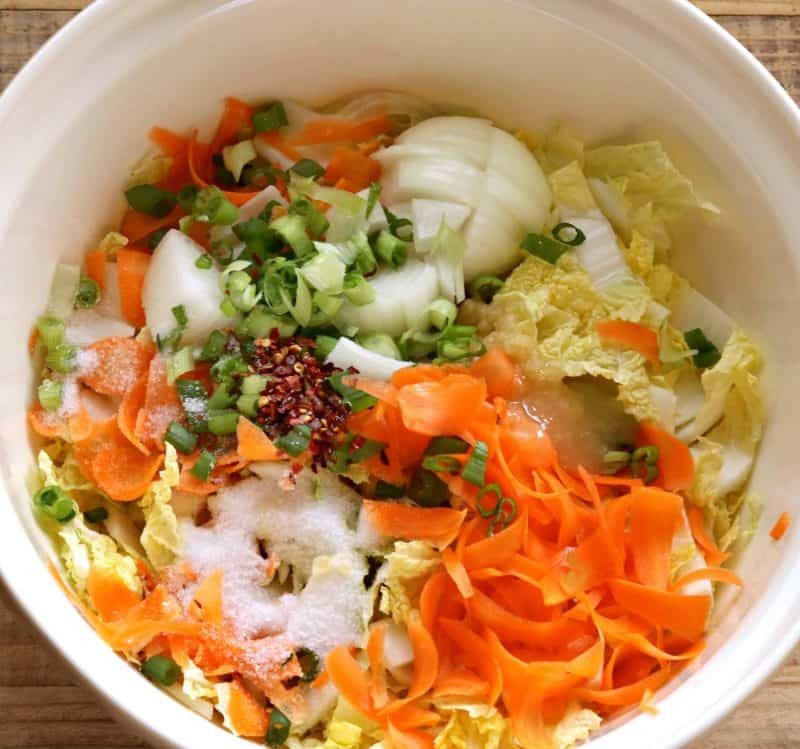 Nutrionists recommend eating more fermented foods to keep our gut healthy. Thank you, Christy, for posting this easy to do recipie . I hope you get the chance to try it soon Kay!! I love kimchi! I’m so excited that you are doing this and the sauerkraut! Talk about expanding our horizons. I love it! I’ve never watched the kdramas before but I think I’ll have to start. 🙂 I had that Nourishing Traditions book at one point but I think I gave it to my daughter. She makes kefir every day which I’ve made a few times myself. Great stuff. I made this Kimchi and it was so easy. Just a note; If you don’t have minced garlic, you can use 2 Tablespoons of Garlic powder and if you want it to be a little bit more spice, you can do 1-1/2 Teaspoon of Dried Chili Flakes. To answer the question someone else asked about the bottled ginger, Walmart has it where the product is located. Both myself and my husband eat kimchi, I introduced him to this great Korean dish.. Thank you for giving us this great recipe..Love all your recipes.. Thanks for giving it a try Gloria, I am so glad you liked it!!! And thank you for sharing some of your tips with us!!! I made this Tuesday night and have been doing the ” burping ” faithfully. Each time alot of liquid gushes out. Do I need to take some veggies out? Or is this normal? My grandmother died when my Mom was nine years old but my Mom always remembered a crock full of a vegetable mixture. She wanted some so bad but I had no idea what it was, sure wish she were here today I would make this and see if that was anything like what she remembers. I bet it was Kimchi!! I got brave and made this! I found the radishes. …they look like white carrots. It made 2 full quarts and about a fourth of a pint. I followed all directions. Well, I Love it!! My favorite way to eat it is…..a saltine cracker smeared with Dukes Mayo topped with the kimchi! Fab–u—lous!!! I am so glad you tried it, and liked it!!!!! Made this today. My husband spent time in Korea and loves kimchi. I tried it for the first time and yes, I am hooked! Thanks for the step by step directions. Looking forward to making your sauerkraut next. I am so glad you tried it and liked it!! I would love it if you would come back and let me know how y’all like this recipe!! We are loving the kimchi….third batch going now….is it done when it no longer needs to be burped? Is it done when all the liquid soaks back into the vegetables? We have been serving with Korean barbecue (bulgoki) which is delicious and low carb as well.